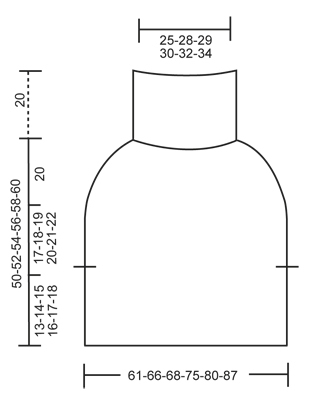 Go to original pattern for design DROPS Extra 0-1164. 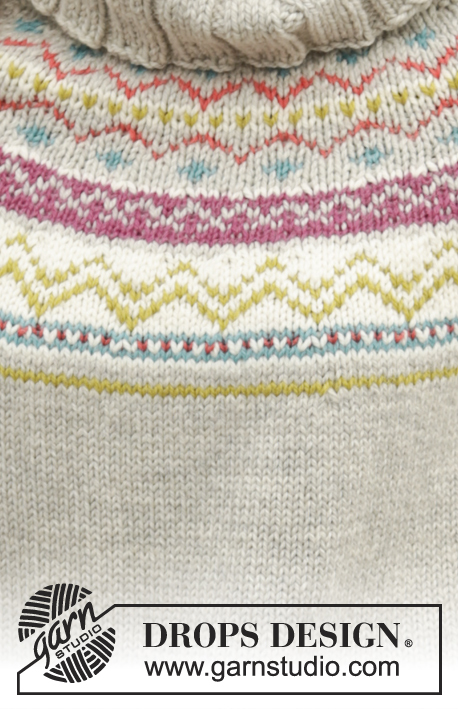 Knitted DROPS poncho with Nordic pattern in ”Nepal”. Size: S - XXXL. 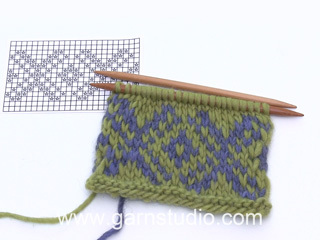 You can get the yarn to make this pattern from	30.80£. Read more. See diagram A.1. Work entire pattern in stocking st.
To calculate how often dec should be done, use the total no of sts on round (e.g. 264 sts) and divide by no of dec to be done (e.g. 32) = 8.25. I.e. in this example K approx. every 7th and 8th st tog. Inc 1 st by making 1 YO, on next round work YO twisted (i.e. work in back loop of st instead front) to avoid holes. 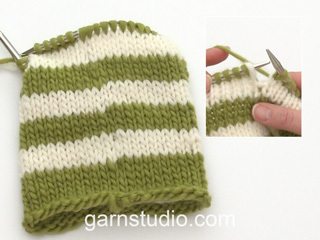 Work back and forth on circular needle up to vent, then work in the round. Cast on 106-114-118-130-138-150 sts on circular needle size 5 mm with light grey. Work 3 rows in GARTER ST - see explanation above (1st row = WS). K 1 row. Then work in stocking st with 5 sts in garter st in each side of piece. 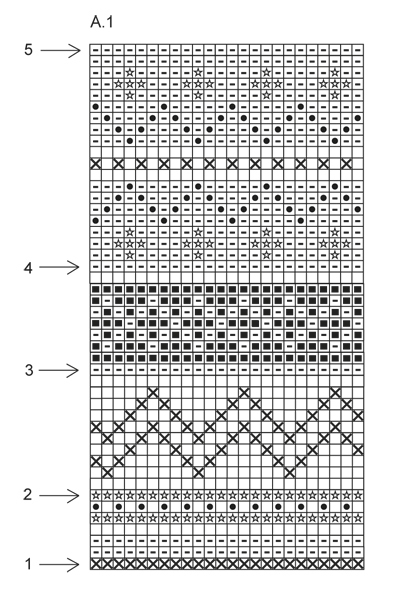 REMEMBER THE KNITTING TENSION When piece measures 13-14-15-16-17-18 cm, dec 1 edge st in each side, adjust so that next row is worked from RS = 104-112-116-128-136-148 sts. Put piece aside and work front piece up to vent. Slip sts front and back piece on to same circular needle = 208-224-232-256-272-296 sts. Then work in stocking st and light grey until piece measures 30-32-34-36-38-40 cm. 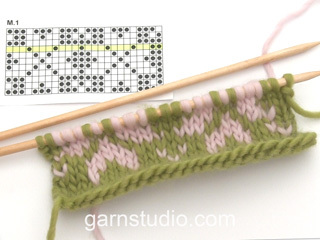 Then work pattern in the round according to diagram A.1 while AT THE SAME TIME on round marked with arrow 1 in diagram dec 6-8-8-10-10-12 sts evenly - READ DECREASE TIP and KNITTING TIP = 202-216-224-246-262-284 sts. Continue pattern. On round marked with arrow 2 in diagram dec 18-24-24-30-30-36 sts evenly = 184-192-200-216-232-248 sts. Continue pattern. On round marked with arrow 3 in diagram dec 32-32-32-36-44-48 sts evenly = 152-160-168-180-188-200 sts. Continue pattern. On round marked with arrow 4 in diagram dec 32-34-36-42-44-50 sts evenly = 120-126-132-138-144-150 sts. Continue pattern. On round marked with arrow 5 in diagram (= last round) dec 34-30-34-36-36-34 sts evenly = 86-96-98-102-108-116 sts. Work 1 round with light grey while inc 4-6-4-6-6-4 sts evenly - READ INCREASE TIP = 90-102-102-108-114-120 sts. 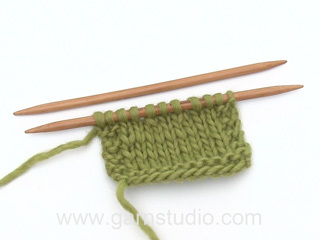 Then work rib in the round = K 2/P 4 on a short circular needle. Loosely cast off with K over K and P over P when rib measures approx. 20 cm. Jag beställde rundstickor nr 5, 40 cm ( trä, kantiga). De har inte kommit. Skulle komma v. 11. Jag har redan betalat dem. Hej Ylva. Du kan bedre kontakte butikken hvor du har bestilt for at höre hvor lang tid der gaar endnu. Håller på att sticka denna poncho och jag stickar slätstickning nerifrån, enl. instruktionerna skall jag börja sticka mönsterstickning då arbetet mäter 34 cm i mitt fall, men nu måste väl arbetet i sin helhet vara 15 + 34? So cute! 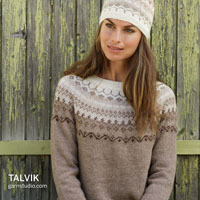 But I don´t think that is a very nordic pattern…not at all in fact. But very cute poncho anyway!